Accounting carries with its history a vast number of ideas which have slowly developed along with it. This volume relates this history as it took place during the first three decades of the twentieth century in the United States. In particular it deals with those individuals who were for the most part responsible for it. 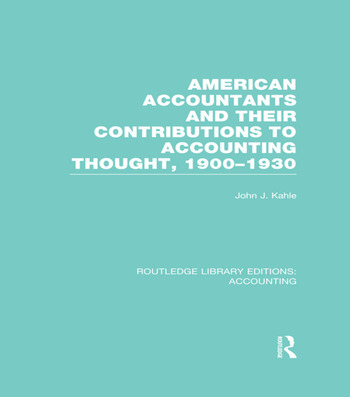 It was these pioneers who recorded their observations of the actual workings of the myriad adaptations and new devices which had slowly eased their way into accounting theory and practice in the USA in the early twentieth century. Foreword. Preface. Introduction. 1. Spurgeon Bell, James H. Bliss, William Morse Cole, Arthur Lowes Dickinson, DeWitt Carl Eggleston, Paul-Joseph Esquerre, Harry Anson Finney, Stephen Gilman, Harry G. Guthmann 2. Henry Rand Hatfield, David Himmelblau, Roy Bernard Kester, Joseph Jerome Klein, Ananias Charles Littleton, James Oscar McKinsey, Robert H. Montgomery, George Hillis Newlove 3. Jerome Lee Nicholson, William Andrew Paton, Charles Forrest Rittenhouse, Early Adolophus Saliers, D. R. Scott, Clinton Homer Scovell, Charles Ezra Sprague, Ross Graham Walker, John R. Wildman. Conclusion, Appendices, Bibliography.